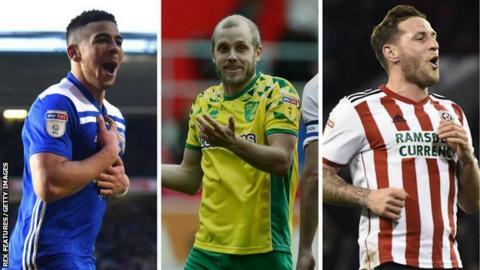 Birmingham striker Che Adams, Norwich forward Teemu Pukki and Sheffield United captain Billy Sharp have been nominated for the EFL's Championship Player of the Season award. Adams, 22, has netted 21 league goals for Blues in 2018-19. Finland international Pukki, 28, is the Championship's leading scorer this season with 24 goals, a tally that has helped Norwich to the top of the table. Sharp, 33, has scored 22 league goals this term, including two hat-tricks. The awards will be presented on 7 April in London and will be given out across 13 categories, with players, managers, clubs and legends of the game set to be honoured and recognised for their achievements. The Young Player of the Season prize will be contested between Derby County's on-loan Liverpool midfielder Harry Wilson, Luton defender James Justin and Norwich right-back Max Aarons. Doncaster forward John Marquis, Luton striker James Collins and Sunderland midfielder Aiden McGeady are in the running for the League One Player of the Season award. Meanwhile, the Bury duo of winger Danny Mayor and midfielder Jay O'Shea will contest the League Two prize, along with Tranmere forward James Norwood. Leaders Norwich City have three players in the Championship team, while fellow promotion contenders Leeds United and Sheffield United have two apiece. Middlesbrough, Wigan Athletic, Hull City and Birmingham City are also represented, while Blades boss Chris Wilder has been selected as manager. Barnsley have four representatives in the League One side and Daniel Stendel has been selected as manager, while leaders Luton Town have three players named. Doncaster Rovers have two players in the team, while winger Aiden McGeady and defender Matt Clarke are Sunderland and Portsmouth's sole inclusions respectively. Four Mansfield Town players are in the League Two team, with leaders Lincoln City and fellow promotion-chasers Bury each having two players included. Newport County goalkeeper Joe Day, Oldham Athletic defender George Edmundson and Tranmere Rovers striker James Norwood make up the rest of the team, while Ryan Lowe of Bury has been chosen as manager.